I appreciated my Chinese heritage. I was born and raised in Hong Kong, a Special Administrative Region of the People's Republic of China, also known as one of the four Asian Tigers, or Little Dragons. Hong Kong is the world's 7th largest trading economy and serves as a major service economy in the region. I am always fond of Hong Kong’s free economy and sharing our economic success stories, and I am very proud to be a Hongkongese. Ruled by the 0.02 percent. However, for over 150 years under the British rule and 20 years since China assumed sovereignty in 1997, the 7.39 million Hong Kong residents to this day still do not have the basic right to vote for their own leader. In the 2017 election, less than 1,200 voters were eligible to cast ballots to elect the new Chief Executive. This small election committee is made up of 70 members of Hong Kong’s legislative chamber, a mix of professionals, business and trade elites, pop stars, priests, and professors. On March 26, a new Chief Executive was chosen by a grand total of 777 votes. In a city of 3.8 million registered voters, this group represents less than 0.02 percent of the population! Unlike most Americans, immigrants like me wait years to have the chance to vote. I first came to the United States as an international student. I brought only two suitcases with me to Iowa and became the first member of my family to receive a college education. Then, as a permanent resident and a green-card holder for nine years, I had the right to work and live permanently in the United States; I was equally protected by all U.S. laws; and I was also required to file and pay local, state, and federal taxes like everyone else. However, I was ineligible to vote in federal elections. I felt like a total outsider. One of the most important privileges of democracy in the United States of America is the right to participate in choosing elected officials through voting in elections. Non-U.S. citizens, including permanent residents, who vote, or register to vote, in a federal election can be removed (deported) from the United States. I was naturalized on June 7, 2017; and a year later, I voted in my first primary election on June 5, 2018. Voting is a constitutional right and privilege that Americans have. Unfortunately, for the 7.39 million Hong Kong residents, being able vote for their own leader is still a distant dream. Now as a citizen of the United States, I treasure this constitutional right I worked so hard to earn. And it’s a privilege that’s at the heart of being an American. Every vote matters. Be sure to vote on November 6. 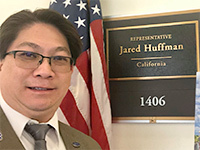 Jason Lau is executive director and senior business officer for the School of Extended and International Education at Sonoma State University and adjunct faculty at Santa Rosa Junior College. Follow him on Twitter @jalau.